Full of personality and requiring less infrastructure than chickens, keeping waterfowl can help your homestead by guarding, keeping bugs at bay and more. A guest post by Kirsten Lie-Nielsen of Hostile Valley Living. Chickens might seem like the go-to bird for a beginning homestead, but ducks and geese can bring many benefits to the small farm. They are relatively easy keepers, requiring less infrastructure than chickens. Ducks and geese can be fun, rewarding animals and it is easy to turn their natural behaviors into advantages for your small farm or homestead. Most waterfowl do not require a pond to be happy birds. They do need water at least a few inches deep in which to clean their beaks when eating, because the air holes in their bills can become blocked. This can be provided with rubber livestock troughs or a kiddie pool in the warmer summer months. You will want to provide your waterfowl with a safe nighttime shelter, and if you are concerned about predators or neighbors a fenced run should be provided with enough space for each bird. While not all ducks and geese are this helpful, many will use that night time shelter as a place to lay their eggs. Ducks can be kept with chickens, although they will not use roosts or nesting boxes (except for a few breeds, such as Muscovies). 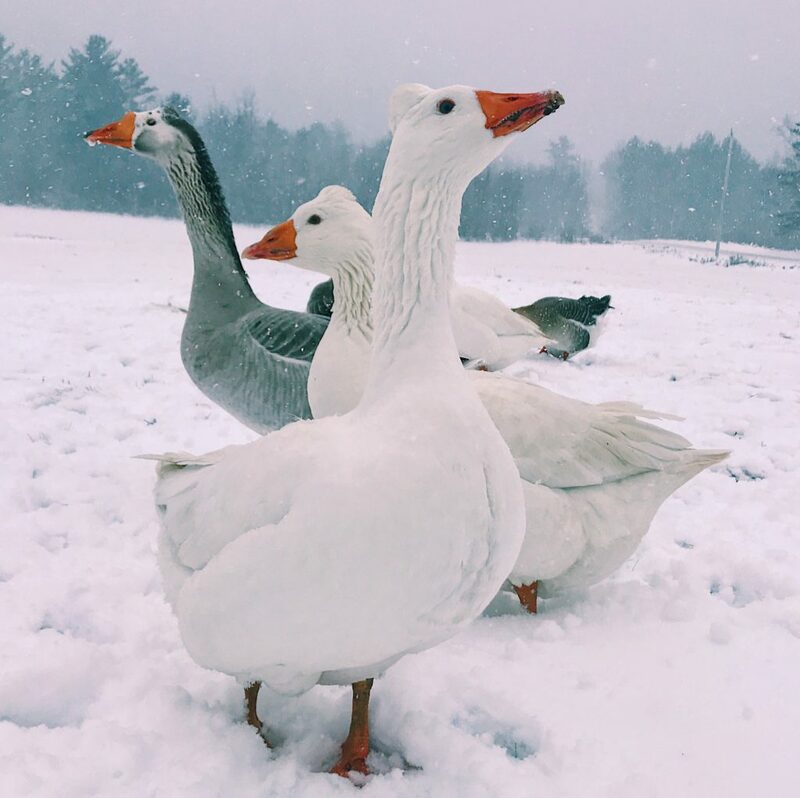 A single goose can sometimes be kept with chickens, but in general, geese should have a separate coop as they can become aggressive towards smaller birds during the early spring mating season. One of the primary benefits of ducks on the farm is their never ending appetites for pests, especially slimy nuisances that other birds turn up their beaks at, such as slugs. To most effectively use ducks for pest control, you will want to be careful as to what plants you allow them access to. They can keep slugs and tomato hornworms out of your garden, but you won’t want to have them at the expense of your lettuce. Ducks used for controlling pests are often most effective if kept just outside a fenced-in vegetable garden or are allowed to wander the rows with supervision, or perhaps with careful fencing off of your growing vegetables. The presence of ducks in a yard can mean an immediate decline in your slug population before those nuisances ever make it into the garden. Or, ducks can be used to protect plants that hold no interest to them, such as in a vineyard or an orchard. It may come as a surprise but one of the most common uses for geese on the modern farm is as weed control. Geese are herbivores, and don’t go in for slugs or bugs. But they do love anything and everything green and growing. Similar to ducks in the garden, the biggest difficulty in using geese as weeders is being careful about where you put them. Geese let loose in a vegetable garden will just eat your lettuce, your weeds, and everything else without discrimination. But this doesn’t mean geese can’t be effective at weeding a garden! You can use fencing along garden rows, or even plant covers to keep the plants you want safe from hungry beaks. There are also some crops geese truly thrive at weeding. Vineyards and orchards work well, but so to berry patches and brambles. The long necks of geese are much more agile than human hands, and they have little interest in berries. 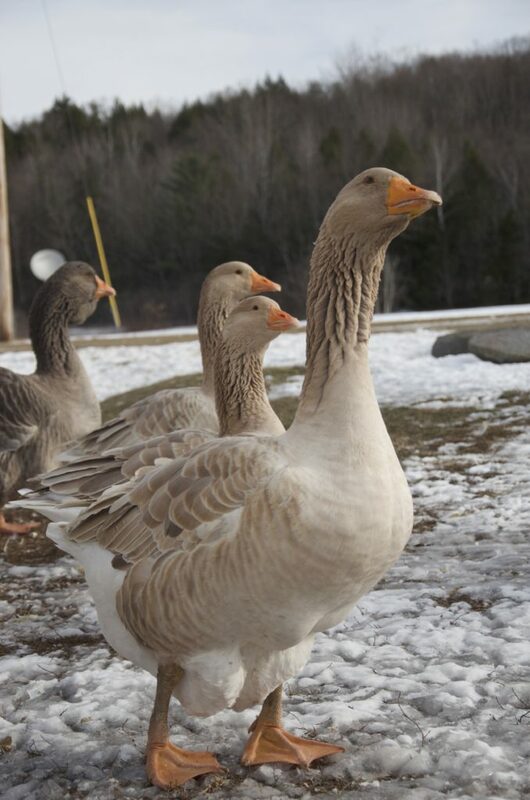 Geese can also be utilized as guard animals for property or flocks of smaller birds such as chickens. They are naturally protective and alert animals. When it comes to protecting chickens, sometimes a single goose is most effective. A single goose raised with chickens will imprint on them, becoming bonded to the smaller birds and fending off anything that attacks them. If you have a larger flock, they can harass the chickens and sometimes it is better to keep them separated, but they can still be good guardians simply by their loud and intimidating presence. In fact, geese are even better guardians of property than they are of other birds. Many people have memories of aggressive geese, and that can be used to your advantage when keeping geese on your property – even if your geese are friendly under all that honking. All of these useful attributes for putting waterfowl to work on your farm are in addition to their more traditional benefits. Geese and ducks are both traditionally raised for meat and eggs, and they can keep you in good supply of rich eggs or offer your farm a unique meat product to sell or use through the winter months. And, the personalities of waterfowl are some of the most fun in the poultry world. So regardless of how you use your ducks and geese, they’ll be sure to bring plenty of entertainment to the small farm or homestead. About the Author: Kirsten Lie-Nielsen is a writer and farmer from Liberty, Maine. She has two books on homesteading, A Modern Homesteader’s Guide to Keeping Geese and So You Want to Be a Modern Homesteader, and she blogs about self-reliant living at hostilevalleyliving.com. You can also follow her farm and animals on Instagram, @hostilevalleylivng.